The Echinoblog: What (and How) do Sea Urchins Eat? Sea Urchin Feeding Roundup! SEA URCHINS! Who doesn't love em? The spiny balls of the sea! We eat em! They're important to marine ecosystems all around the world! They're often visually stunning and they do all sorts of neat and wacky things! But sometimes I get ahead of myself and forget the basics! Basic questions that everyone has aren't often obvious and so this week a quick summary overview: What and How do sea urchins eat??? 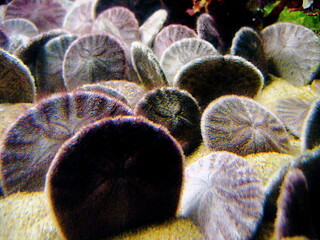 Urchins feed primarily with a unique jaw-like structure known as Aristotle's lantern. It looks like this in most urchins but is modified in so-called "Irregular" urchins such as sand dollars, sea biscuits and etc. A bit about this here. For the FULL effect go here to LISTEN as the urchins graze: teeth to reef.. HERE is the accompanying summary account & background. Believe it or not. Sea urchins have among the most diverse feeding modes within the Echinodermata. Here is a roundup... COUNTING DOWN! This is the one everybody knows about and the feeding mode with which most people are most familiar. Many sea urchins prefer kelp and various other seaweeds and marine "plants." There are several species found in cold-temperate water habitats.. California, New Zealand, Chile.. to name a few, and all these places have sea urchin species in abundance. 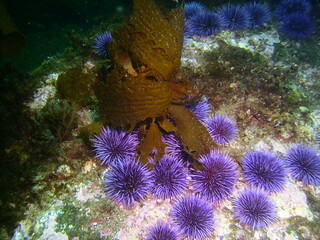 Here is the famous purple sea urchin, Strongylocentrotus purpuratus engaged in some kelp feeding! Here is a nice Shape of Life video that shows feeding by the Purple sea urchin Strongylocentrotus purpuratus. 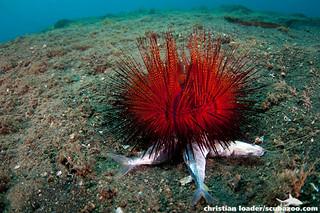 Echinoderms: Urchin Time-lapse: Eating Kelp from Shape of Life on Vimeo. 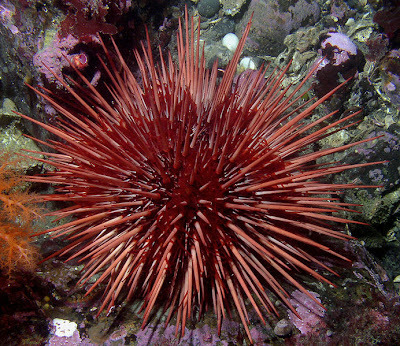 Most people (even several biologists) don't realize that sea urchins can be pretty flexible in their diet. If kelp isn't available, they will obtain whatever nutrition happens to be available. Some large examples of food here, but feeding also includes microalgae (such as diatoms), encrusting algae, moss animals (i.e. bryozoans) and etc. Here we have what Strongylocentrotus spp. in the Arctic or sub Arctic feeding on what looks like a wayward or moribund jellyfish..
Up until recently though, feeding in sea urchins has been thought to be relatively passive and opportunistic. Whatever comes along is good to go! 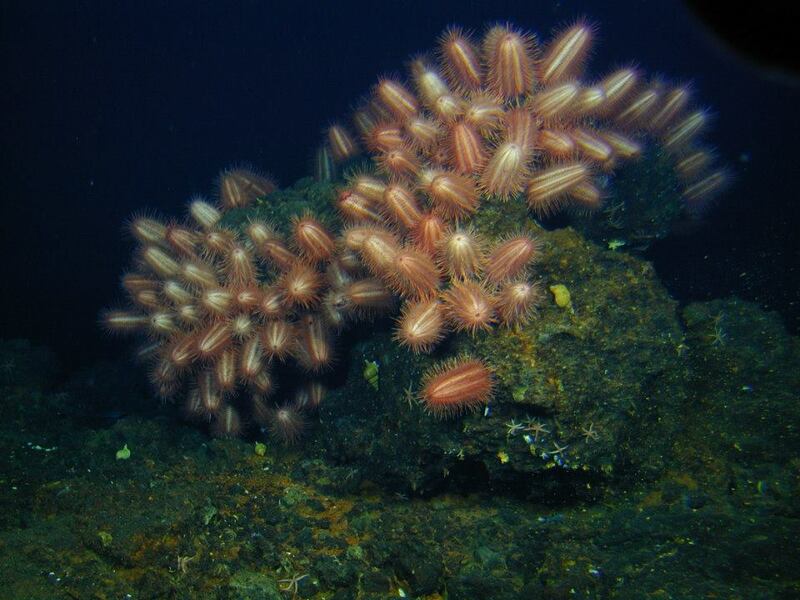 Probably one of the most dramatic deep-sea/paleontology events in the last few years was the discovery that, not only could stalked crinoids (echinoderms with a ring of feeding tentacles and a stalk) crawl BUT they did so with some urgency! It turns out that they were running from Cidaroid SEA URCHINS. I've written up these papers here. WARNING! 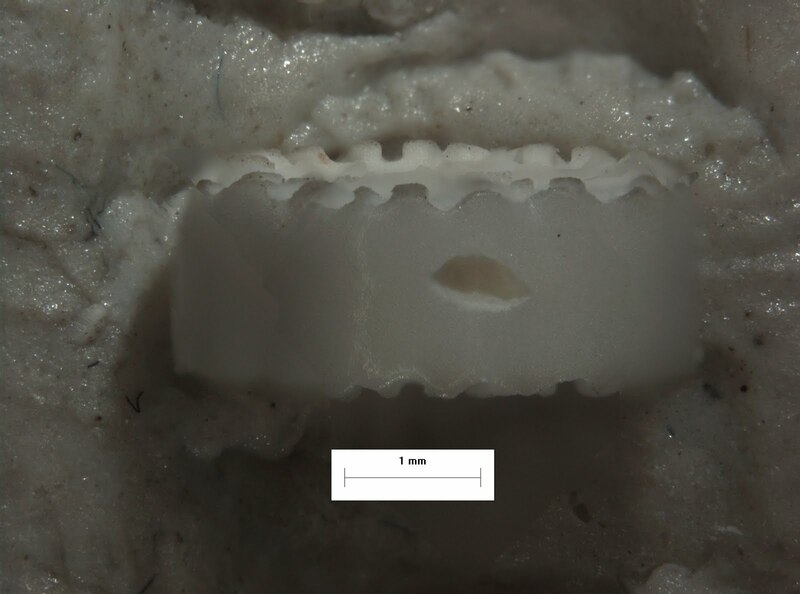 Those who do not wish to watch crinoids being brutalized and devoured should avert their eyes! There have also been recent accounts that leaving sea urchins in large numbers under artificial circumstances (sea urchin farms) leads to cannibalism! (here) Sea Urchins eating OTHER Sea Urchins!! Whew! That was quite a violent section for sea urchins, wasn't it??? Let's go to something a bit more majestic! One of the NEATEST stories in sea urchin evolution is how a major sub group, the "irregularia" aka the sand dollars, sea biscuits, and spatangoid ('heart urchins') sea urchins all evolved from a more open lifestyle with the feeding modes shown above (herbivory, predation, omnivory) to a specialized series of body forms that involve plowing through sediment/mud/sand in order to obtain food. Deposit or sediment feeding. A more involved post of this story can be found in this post. Feeding in these animals is intrinsically connected with their life mode and body shape. Here are some videos that show some of these animals plowing through sand...sometimes just to get around but maybe also to feed? Again.. check out the spines! So, now that I just got done telling you that sand dollars and their relatives are deposit feeders.. I will immediately point out the exception! 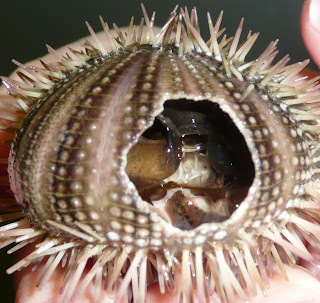 Perhaps the most UNUSUAL feeding mode in sea urchins is filter feeding, i.e., obtaining food from water currents using some kind of sieve or screen. 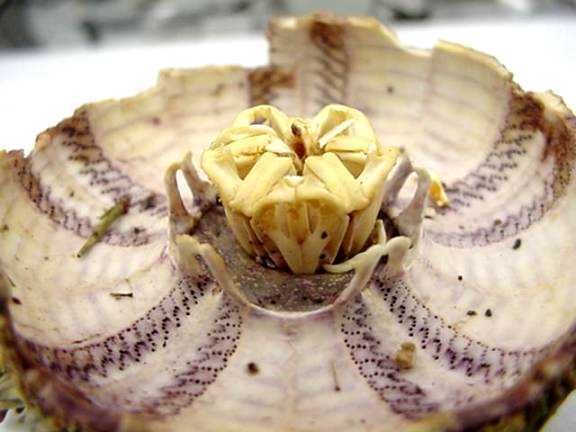 Dendraster excentricus-is the so-called "Eccentric Sand Dollar"which lives along the west coast of North America. So named for the very erratic pattern of its feeding grooves on the oral surface. Note an oddity in its feeding posture.. these animals are tilted at an angle into the water current standing on its "side" in the sand. 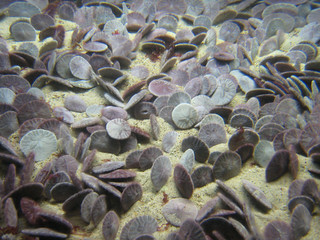 Other sand dollars such as the ones listed under #3 lie flat on the sandy bottom. Dendraster uses its tube feet, pedicellariae and spines to pass along food caught from the water currents to the mouth.. More info on this species to be found here.. This is a pretty commonly encountered animal, but really when you look at them in this fashion, they are freaky deaky! Dermechinus horridus So yes. Saved the BEST for last! 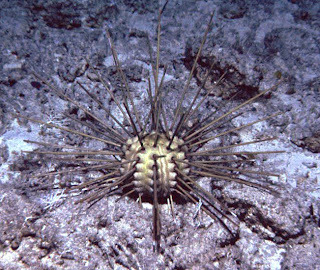 Dermechinus horridus is a strange deep-sea sea urchin which has a body, literally shaped like a cactus, with sharp, needle-like spines to boot! It is among the oddest of the sea urchins known. And although I don't wish to steal his thunder, let's just say that info from a recent International Echinoderm Conference presents some intriguing possibilities! Spiny balls! Predators! Diggers! Eaters of Kelp and Purveyors of fine watery nutriton! Huzzah! what eats the sea urchin? BE SPECIFIC!!!!!!!!!! which species? If you're gonna be specific you'll have to be specific! This was a really helpful article. I've only just started keeping a marine aquarium in my home, and I have only two (so far) urchins in it -- I was concerned about their apparent habitual predation on some of my snails, but after reading your article, I'm not as concerned. I guess the urchins are feeding off the shells, not the snails themselves. Thank you for posting this information -- I quite enjoyed reading all of it. My shorts pined sea urchin went inside my HOB filter. Do you think he was searching for food? I moved him back into the tank and he seems to be fine. Its hard to say. Could have been food or maybe some other factor like water current. Thank you. I think I'll clip some seaweed on the other side of the tank to encourage it to hang out over there. Thanks for the interesting post, I have always been fascinated by echinoderms and urchins in particular. On a recent snorkel, I photographed a small collection of Cape urchins (Parechinus angulosus) off one of the beaches in Cape Town, South Africa. These urchins were surrounded and covered by the egg cases from a puffadder shyshark (Haploblepharus edwardsii) and I just assumed that they were placed there by their mother. I did though wonder at the number of egg cases (approximately 9) in such close proximity to each other as these sharks lay no more than two at a time. 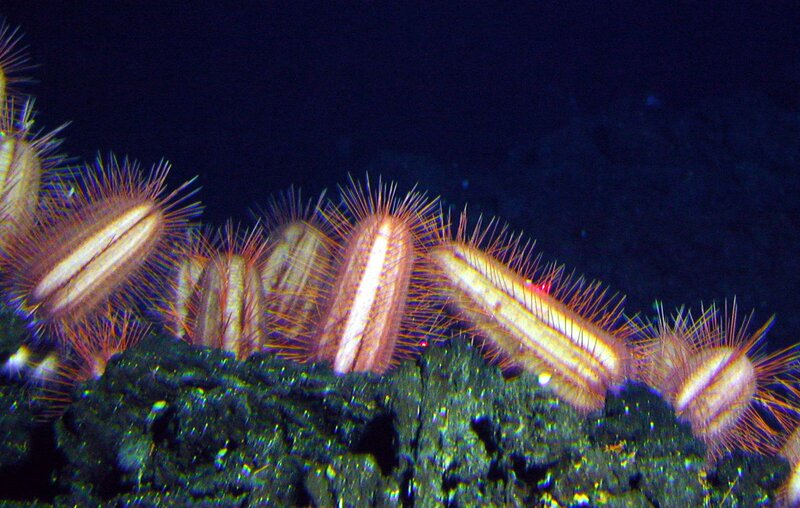 Someone has suggested that instead of the mother placing them in an urchin bed, the urchins, being opportunists, found and fed on them and the cases are the result of a gourmet meal. Is this a fairly common occurrence, shark eggs forming part of their diet? The natural history/ecology of this region is poorly understood and much remains to be learned. Based on what you've told me there are several interpretations of your observations. 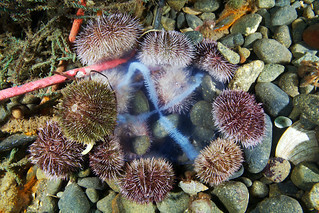 Urchins sometimes "decorate" themselves with adjacent debris and other items to protect themselves from UV or yes..it could be possible the sharks put them there. And as you've suggested its also possible the urchins are simply feeding. Its difficult to say..especially without having seen the image. Much of this would depend on the posture of the urchins as well as the habits of the shark. Lots to be learned! !